The meeting was held at Colette's home with Jane hosting. Present were Carla, Colette, Betty, Jane, Janet and Michèle. 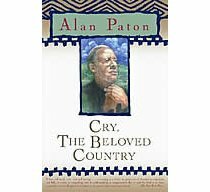 This month's book Cry, the Beloved Country by Alan Paton was presented by Janet. Since the story is in South Africa, Jane provided us with wonderful sausage called Boerwors served with a wonderful mango chutney and Biltong which is a South African dried meat. There was also a very nice maple cheese and of course, we were served a South African wine. Later with coffee and tea, Jane served a lemon basil ice cream with a lemon/blueberry cake. Thank you Jane for a wonderful spread! Janet first read the book in 1998 when she was living in South Africa with her family as a Ph.D. student. Alan Paton wrote the book in 1946 as he was travelling the world visiting reform schools in different countries. It was first published in 1948 in the United States a few months before Apartheid laws were adopted in South Africa. The book was banned in South Africa. It is sometimes considered as South Africa's version of Uncle Tom's Cabin. As Harriet Beecher Stowe's novel highlighted slavery and the abolitionist movement in the United States, Cry, the Beloved Country showed how segregation, that existed even before Apartheid, contributed to the "brokeness" of tribal culture and left many Africans without the traditions and support of their tribes. A way of life that provided meaning and purpose was fast disappearing, leaving the young people searching and no reason to remain in their villages. It is very similar to what has happened to our Aboriginal communities in Canada. The novel is about two fathers searching for their sons. Stephen Kumalo's who is a Zulu priest and a white landowner James Jarvis. In the context of the stories of these two men, the author Alan Paton, develops several themes, family relationships, good and evil, temptation, forgiveness and reconciliation. Both men find themselves journeying to Johannesburg. We first meet Stephen who originally goes to Johannesburg after receiving a message that his sister Gertrude is in trouble. He goes, hoping to also see his son Absalom and his brother John. He finally finds his son, but only after Absalom has murdered James Jarvis' son Arthur. Stephen is heartbroken by the events that take his sister back to a life of disrepute and his son to execution. However, the kindness of people he meets that help him in Johannesburg gives him hope and he goes back to his village with a sense of peace. We meet James Jarvis, who is from the same region as Stephen, when goes down to Johannesburg to claim his son's body after he is murdered and discovers Arthur's beliefs as he reads through his notes. He realizes that he has lived in a cocoon, ignoring what has gone on outside of his farm. He reads Abraham Lincoln's Gettysburg address that he finds in Arthur's house. As he reads more and more of his son's writings, he begins to rethink his relationship with the villagers that live near his farm. Everyone loved this book and several of our members quoted passages from the book. Arthur's text in chapter 21 that James reads begins "The truth is that our civilization is not Christian it is a tragic compound of great ideal and fearful practice, of high assurance and desperate anxiety, of loving charity and fearful clutching of possessions. Allow me a minute. . . ."
There is the text in chapter 11 that gives the book its title and reminds us that though South Africa is a beautiful land, the problems caused by the separation of the races are grave and ingrained and there is still a long road ahead before all that South Africa has to offer can be embraced. "This is no time to talk of hedges and fields, or the beauties of any country. . . . Cry for the broken tribe, for the law and the custom that is gone. Aye, and cry aloud for the man who is dead, for the woman and children bereaved. Cry, the beloved country, these things are not yet at an end." And of course there is also the quote from the Mission House Minister, Msimangu who greets Stephen, helps him find his sister Gertrude, and finds him a place to stay. Msimangu fears that antagonists such as John Kumalo, Stephen's brother, will bring hate. "I see only one hope for our country, and that is when white men and black men . . . desiring only the good of their country, come together to work for it. . . . I have one great fear in my heart, that one day when they are turned to loving, they will find we are turned to hating." Everyone agreed that this is an eloquent and powerful book that has become a modern classic, still read in classrooms everywhere. The characters were well developed and as a reader you engaged with them. You hoped that Gertrude would succeed in making a better life for her young son. You felt for Stephen every time he gave in to his weaknesses and cheered when he was hopeful. The descriptions of the countryside give you images of the beauty South Africa has to offer. Thank you Janet for this wonderful book choice. I'm especially sorry that I wasn't there for this book because it was just amazing. The kinship between the two grieving fathers Jarvis and Kumalo was very moving. I felt I learned a lot about South Africa as well--the language, the culture, the politics, the changing world there. And yet the traditional viewpoint through the eyes of the wise and kind old umfundisi was so poetic, at times almost sacred. I just finished re-watching the movie The Help, and I have the book by the same name on my "to read" shelf, and it shows how recently race relations have been a problem in North America as well. My prayer is that things are improving. Thank you for this choice, Janet.